Venus is the second-closest planet to the Sun, orbiting it every 224.7 Earth days. The planet is named after Venus, the Roman goddess of love. It is the brightest natural object in the night sky, except for the Moon, reaching an apparent magnitude of &#8722;4.6. Because Venus is an inferior planet from Earth, it never appears to venture far from the Sun: its elongation reaches a maximum of 47.8°. Venus reaches its maximum brightness shortly before sunrise or shortly after sunset, for which reason it is often called the Morning Star or the Evening Star. Venus in IR (Astronomik ProPlanet 807) and UV (W47 + BG39) light. IR mapped as red, UV as blue, and green is a 50/50 combination of the two. Here is a comparison image of Venus on March 22 and 23.
where (g) is a synthethic green channel (just the average of the other two). On March 22 I didn't capture IR, so I just R for red ;) The IR and R recordings were very much comparable, as I didn't process them hard at all (so all the color information basically comes from the UV channel). Here is a small animation in UV light (with a W47 filter) showing clouds moving rapidly on Venus. The animation spans only 35 minutes. 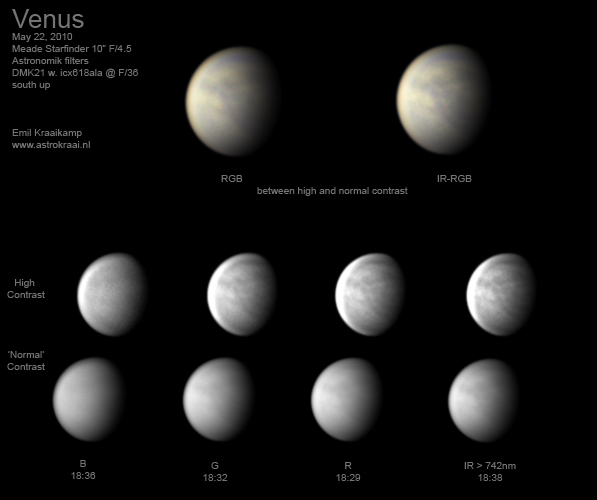 The still image shows Venus in UV-RGB. Venus under excellent seeing conditions. The seeing seemed pretty decent, but the transparancy was very poor this evening. I only managed to take one quick run of images from uv, b, g, r to ir in a couple minutes time, before Venus disappeared behind the clouds completely. Attached is the rather soft looking RGB result. Animation of two stacks of recordings in infrared light (>807nm) taken 45 minutes apart. You can see some cloud structures moving on the planet. Seeing was not very good (but hurray for long wavelengths! ), next time I hope the clouds don't interfere with imaging, because it would be nice to get a longer/smoother animation. False color image of Venus using an Ir-pass filter (>807nm) and a Schuler UV filter. Ir was used for luminance.